The Old Viscosity poured a tiny light brown head with out any lacing. The head was very small and fully diminishing, and thhe black body had a very thick density. The nose detected a moderate amount of malt presence with hints of very sweet molasses. It was quite pleasant to the nose, but a strong alcohol presence was noted. The taste buds were not surprised with the moderately sweet initial flavor, but were rather surprised with the light bitter finished that hung around for a while. 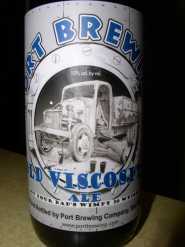 Creamy and with a full body, the Old Viscosity had light astringent characteristics with very soft carbonation. Reviewer's notes: As you can see with the scoring, we were quite pleased with this offering by Pizza Port. It is a very strong selection and we recommend giving this a try...with caution.